This past weekend we were not able to update the blog as usual because we were at the Mohegan Sun Casino in Uncasville, Connecticut. We were there helping to promote the Pocono Cup Soccer Tournament. Naturally we had to check out the food scene Mohegan Sun had to offer. That is when we saw that there was a Bobby's Burger Palace (BBP). BBP is chef Bobby Flay's burger chain, which has 9 different locations in the Northeast. We have eaten at a handful of Bobby's restaurants in the past and always came away satisfied so we were hoping for the same from BBP. BBP has a nice menu consisting of burgers, sandwiches, grilled cheese and salads. Lets take a look at BBP's burger options. When ordering a burger your first order of business is to choose what kind of meat you would like. BBP offers you the ability to get any of their burger options made with Certified Angus Beef, Ground Turkey or Chicken Breast. You then have to choose from 10 permanent options on the menu and 1 burger of the month. The burger of the month is a nice option providing new burgers all year round. This month the new burger was a Chicago Burger, this was a burger with American Cheese, Sweet Relish, Banana Peppers, Celery Salt, Onion, Tomato, Pickles. Another interesting touch that BBP offers is the ability to have your burger "Crunchified". The "Crunchifed" process involves adding a hand full of regular potato chips on top of any burger. After you choose your burger you know your going to waat some French fries. BBP offers regular French fries, sweet potato fries and beer battered onion rings. You can also choose to finish off your meal with a milkshake or even spiked milkshake, a Vanilla Carmel Bourbon milkshake sounds like our type of desert. After looking at those pictures we know your dying to check out a BBP. When we first looked at our meal we will say we were a bit concerned. The burger and fries looked very similar to our meal from Five Guys. If you didn't see our review of Five Guys check it out here, but we were not fans. We didn't want to deal with that kind of disappointment again, but we had faith in Bobby and dug in. Our faith was rewarded with some great burgers. The sign of a good burger place is how well they are able to cook your burger. It is all too often that your burger is ordered medium or medium rare and it comes to you well done. BBP makes it a point to ask you specifically how you want it, even providing this nifty chart. 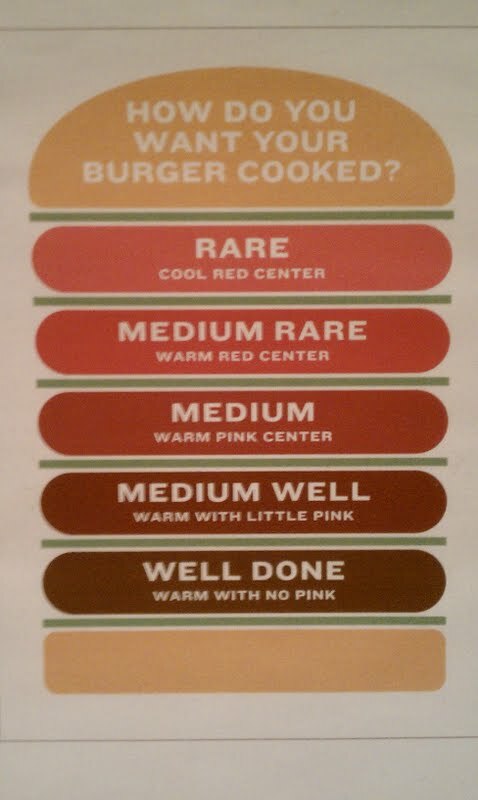 We prefer our burgers cooked medium giving us a nice warm pink center. After we took our first bite we got to see that our burger was cooked exactly how we asked. Like we said that is a sign of a good burger place. The burgers were served on a classic hamburger bun covered in sesame seeds. There was nothing special about this bun, but it didn't take anything away from the burger. A properly cooked burger is step one, the of choice bun is step two and the toppings are the finishing touches to a great burger. BBP nailed step one, step two was nothing special but they really shined when it came to the toppings. The first burger we had was the Santa Fe burger which was topped with Queso Sauce, Pickled Jalapenos and Blue Corn Chips. The queso sauce oozed off this burger and had great flavor. It was then topped with the pickled jalapenos, which gave this burger some heat and paired nicely with the queso sauce. All of this was then topped with the blue corn chips you can see above. The crunch from the chips was a nice addition to the burger, but we did notice a few of them were a bit soggy. This was probably our fault though because we got these burgers to go. If we had eaten in the restaurant we are sure they all would have been nice and crispy. This burger was essentially topped with nachos and was very good. After eating this burger the first day at Mohegan Sun, we knew we would be getting another burger the next day. To go with the burger we ordered regular French fries which are served with BBP's own fry sauce. The fry sauce seems to be some type of chipotle aoli. It had a nice bite thanks to the chipotle peppers and worked well with the fries. The fries were the hand cut variety with the skin on. As we have said in the past these are not our favorite type of fry because many places do not cook them properly. BBP however managed to cook them to a perfect crunch and seasoned them with the right amount of salt. We fully enjoyed these fries, so all restaurants with hand cut fries should take notes from BBP. On day two we ordered the L.A. Burger. The L.A. Burger is topped with avocado relish, watercress, cheddar cheese and tomato. Our burger was cooked exactly as ordered, so it was no fluke. The burger was topped with a nice piece of cheddar cheese followed by a fresh, thick cut slice of tomato. Then you will see a healthy mound of avocado relish, which was so good. The avocado relish was freshly made, ripe and creamy. We love avocados on just about every type of sandwich, but they seem to go the best with burgers. Spread on top of the avocado relish was fresh watercress. Watercress is a peppery green often used in salads. We have not eaten a lot of watercress but we found it to be a nice alternative to the classic burger lettuce. It added to the avocado relish enhancing the flavor without taking too much attention away from the burger. The Santa Fe Burger was good, but the L.A. Burger was amazing. It was piled high with toppings and flavor, and it will be added to our top 10 list of best burgers we have ever had. Since we tried to fries already we decided to give the beer batter onion rings a shot. The portion size was good with 7 of the largest onion rings we have ever had. The beer batter was tasty but we found the onion rings to be a bit soggy and greasy. They we decent onion rings but nothing to write home about. It was nice to try them but we would not order them again. Bobby's Burger Palace served us one really good burger (Santa Fe) and one great burger (L.A. Burger). These burgers paired with perfectly cooked fries makes BBP a Should Eat. We can't wait to try some more of these burgers the next time we see a BBP. If you are near a BBP and have never been stop reading this blog and go get a L.A. Burger.